To thrive, companies and industries need to look at “disruptive technologies and processes” as opportunities rather than threats. For construction, we have experienced a breakthrough with the convergence of new thinking and technology that creates an integrated management framework for delivering projects more efficiently and offering greater customer value. DPR Construction is a forward-thinking national commercial general building contractor and construction manager specializing in technically complex and sustainable projects for the advanced technology, life sciences, healthcare, higher education and corporate office markets. With 17 offices around the country, DPR, an employee-owned general partnership, has grown into a multi-billion-dollar organization with more than 2,000 professional and craft employees. The DPR story begins in July of 1990. Armed with $750,000 of pooled resources, three construction industry veterans, Doug Woods, Peter Nosler and Ron Davidowski (the D, P and R) co-founded DPR and set out to do something differently in an industry traditionally resistant to change. To do so, they looked to others outside the construction industry, including then Stanford Professor Jim Collins. The now student and teacher of enduring great companies and business book author, Collins met with a group of DPR employees in early 1992 to help us identify and articulate our purpose and core values: Purpose - DPR exists to build great things and Core Values - integrity, enjoyment, uniqueness, and ever forward. 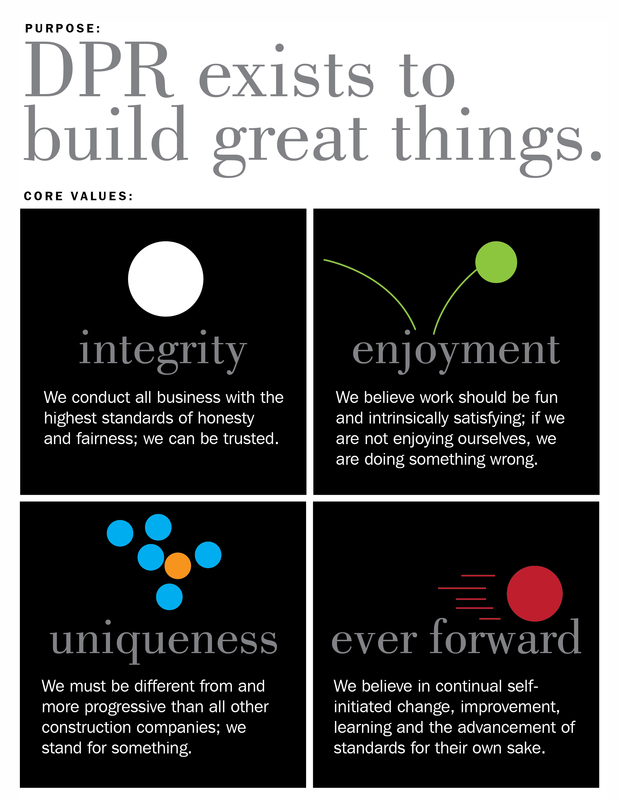 Our purpose and values are a starting point and underlie the passion that drives us to be better and different. They allow the freedoms of an entrepreneurial organization, where we are empowered to make decisions, to make a different with our ideas and hard work, to find solutions, and above all, challenge traditional ways of doing things—moving both the company and the industry forward. The construction industry has seen declining productivity for at least a quarter century and healthcare construction reached a crisis point in California early part of this decade. On one hand the complexity of these projects had increased with the advent of newer healthcare technologies and the facilities needed to support these new life saving technologies but the project delivery process remained the same old one resulting in costlier delays and litigations. Sutter Health, a healthcare owner organization and DPR customer, realized that this is an unsustainable path and adopted Lean Project Delivery to address the wasteful practices and help bring their projects on time and within budget. Around the same time computer-aided technologies that allowed for parametric representation of multiple aspects of a building’s structural, architectural, mechanical, electrical and plumbing elements became mature enough to be adopted in the industry. The combination of owners fed up with the old of way of doing things and hungry for change, adoption of Lean process and this parametric CAD technology called Building Information Modeling (BIM) acted as the perfect combination of catalysts for changing century old project delivery practices in the construction industry. The idea of Lean construction came from the observation of the fundamental role that production practices Toyota pioneered under Toyota Production system, later termed Lean Production. These practices transformed manufacturing and continue to do so to this day. The adoption of Lean methods in construction, since late 1990s, had similar aims and objectives for the construction industry. On a parallel track many researchers also focused on application of computing technologies like visualization, artificial intelligence, database and object oriented representations to solve some of the "product" focused challenges in the construction industry. The development of computer-aided design and the subsequent development of parametric CAD, commonly called BIM, allowed for much rapid iteration of product designs than what was possible before. When BIM first emerged in the commercial construction industry in the 1990s, the consensus was it would revolutionize AEC industry. For thousands of years, the AEC industry has used two-dimensional drawings or time-consuming stick/clay/cardboard models for designing and constructing buildings. The maturing of lean processes for construction, BIM technologies and owner demand for change were three most important characteristics that acted as triggers. These days it is virtually impossible to make it through an architecture, engineering or construction event without hearing about BIM. BIM, which is a dynamic, three-dimensional computer-generated model for the design, construction and operation of a building or a project, can be considered a “disruptive technology” in the architecture, engineering and construction (AEC) industry. Having the ability to simulate design and construction in a virtual environment offered the promise of substantial cost and time savings on developing projects. Re-organizing the project team to allow downstream knowledge of builders to be merged with the design team into an integrated and "single virtual company" project organization. The use of BIM tools and methods and Lean practices necessitated the involvement of downstream players in the design process. In a traditional delivery approach, designers complete designs, and then shop drawings for building are created by construction companies. Now, through the use of BIM all of that information can be incorporated into a virtual model of the building. However to do so, you must include the knowledge of builders in the design process. Otherwise, you could not create the right models to build from and would lose the opportunity to drive out waste from the construction process. This triggered an unprecedented soul searching among many companies within our industry as it was a shift from a traditional project delivery approach and would require different “behaviors and handoffs” among project team members. For DPR, however, this was a welcomed opportunity to play a more meaningful role in helping to solve potential issues in the field much earlier using these advanced tools and helping to “depoliticize decision-making” with more project stakeholders working together as one collaborative team. Rapid adoption of BIM technology and practices for coordination and analysis. Adoption of BIM tools and methods for coordination and analysis was another big change. Availability of BIM tools created positions unheard of on construction teams, such as BIM Engineer, BIM Integrator, etc. Companies had to respond quickly to hire or train people into learning and mastering commercially available tools to apply them during the design and construction phase. Some companies, such as ours, were able to mobilize and adopt these new tools and methods much more rapidly than others. With a company culture that emphasizes innovation and places a great deal of trust in individual employees to drive change and improvement, DPR is often at the forefront of industry trends such as BIM. Understanding of Lean practices and how they apply to design and construction. Lean methods and practitioners focused on two important goals: Reduction of waste and an increase in reliability in project delivery. To achieve these goals requires designers and builders to work very closely together so that what one entity produces is not wasteful for the other. In other words, the traditional design and construction silos, where the design and building teams work separately in a more linear or parallel fashion, must be broken down. As one architect on a project put it, “architects must start thinking like contractors and contractors like architects.” This approach requires design and construction entities to see each other more as partners and customer/supplier of information and knowledge to each other for the success of the overall project. This also means the century old division of labor practices, which fragmented the industry, had to be re-evaluated so that the benefits of BIM and Lean could be adopted for creating value for the owner. This created huge changes in organizations since the traditional risk management mentality within the organizations had to change to more understanding and collaboration very quickly and designers had to learn how to deeply collaborate and integrate with contractors and vice versa. Our organization had to learn the use of rapidly changing technology tools for BIM to be able to participate in projects using these technologies. This involved procurement of hardware, software and training very quickly and then getting it integrated into existing and functioning project teams. For example, in 2005, we did not have any software for BIM. Today, we have deep expertise in more than 50 titles of software applications, which is unprecedented growth in any industry let alone construction, which is traditionally a very poor adopter of technology. Our rapid learning and adoption of BIM was managed through a couple of different approaches: 1) as a company we made a public commitment to the use of BIM and put real resources in terms of people and dollars to make it happen and 2) we placed trust in the young engineers, giving them the responsibility and encouragement to drive change throughout our established organization. The biggest organizational challenge we had was how to make this implementation and change happen in context of projects where budgets are tight and there is no precedence for adoption of technologies. The management approach to solve this challenge was to create the capacity in terms of resources to apply this technology and new practices as a corporate Innovation initiative. This allowed project teams to experiment with different approaches and not be constrained by tight project budgets. Once success was evident on key projects, the adoption was much more rapid. The other key aspect of the organizational challenge was not to treat this only as an application of technology. The team developed a new narrative to describe the disruptive technology based on the famous hype curve that encapsulates the lessons learned from advent of Internet Technologies and subsequent dot-com bust. 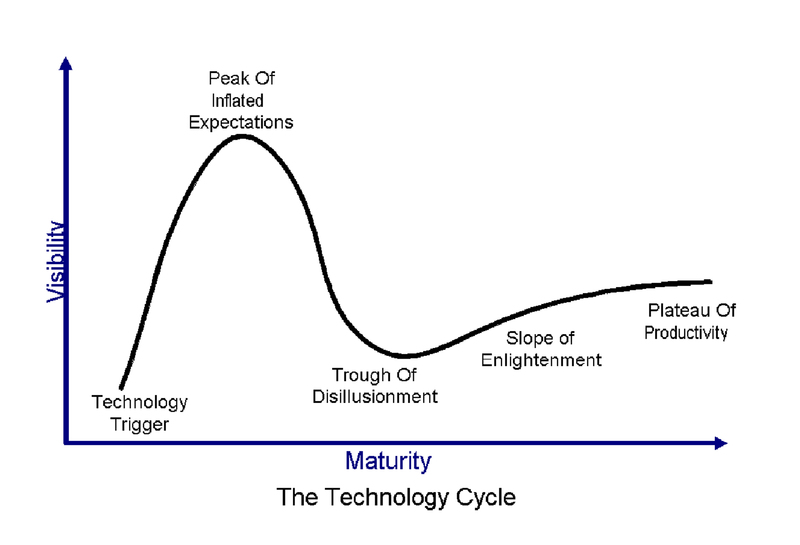 The BIM Hype cycle, based on Gartner's Hype curve, is used to describe what happens due to introduction of new and disruptive technologies. This narrative helped describe how the industry should treat the new disruption due to BIM and highlighted the importance of process and organizational approach—not just technology to gain benefits. It also created the right framework of discussion with project team participants. The teams understood not only the disruptive nature of BIM but also that the disruptive nature can only do so much. To unleash the benefits, process and organizational changes, such as adoption of lean, involvement of builders in design, and creation of single-entity virtual organizations, were all necessary ingredients. Looking at BIM from this perspective was unlike what others were preaching in the industry at the time, and although painful at first, with proven results achieved, we are being hailed as pioneers. We compared the benefits of what we described a collaborative virtual building process with the traditional process and have seen that there are many benefits to be had. For example, on one $100 million project, the team was able to save $9 million and reduce the schedule by 6 months (see attached graph). 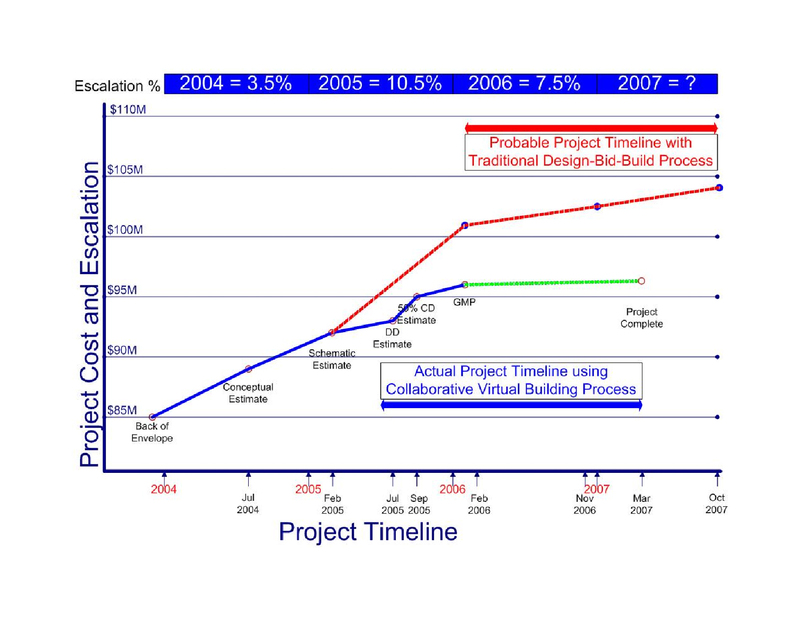 Graph that compared the cost and schedule for traditional project delivery approach to the collaborative virtual building project delivery approach on $100 million Camino Medical Office Building project, where $9 million was saved and 6 months in schedule reduced. Through integrated teams and use of BIM, we are able to deliver projects much more efficiently and with greater predictability for our customers. The unintended side effects are that we have not had a litigious project in the last 4 years when we have used these new methods. We have been able to repeat the results on other projects. 1. Create organizational capacity to foster the innovation and do this on real projects where results matter and are seen rather than putting the burden on existing project teams. 2. Look for convergence of technologies, processes and customer demand. For example BIM, Lean and owner demand for something new intersected to create a perfect opportunity for our company but with one thing missing it might not have happened. 3. Learn from history and create a different narrative. BIM was a technology innovation but learning from the history or Internet technologies which created both winners and losers we could describe the advent of BIM through the technology trigger hype cycle. This narrative emphasized the key aspects of taking advantage of the disruptive technology, which is technology itself but also process and organizational changes. Absent this narrative we would likely have repeated the irrational exuberance of what technology could do but did not fall into that trap.